Last spring Gavin’s kindergarten class planted sunflower seeds and they brought home their little plants. We had a great time watching his flower grow and kept moving it from pot to pot as it got taller and taller. We also planted some sunflowers at the community garden and they were much larger flowers than the one Gavin planted at school. 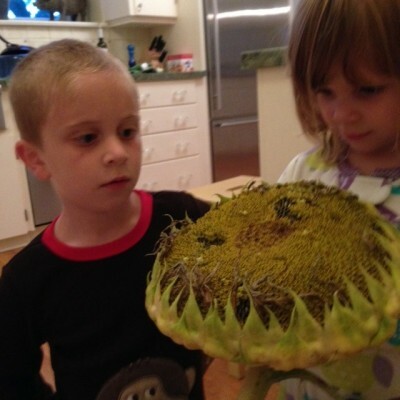 The giant sunflowers are perfect for harvesting seeds and we recently brought one of the flower heads home from the garden to experiment with. 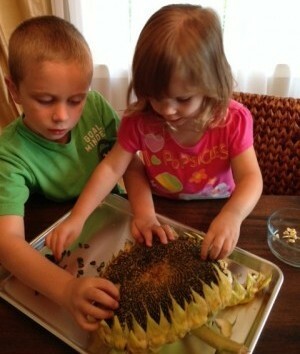 Playing with sunflowers is a great project for kids because they are so rewarding. Watching something grow taller than yourself if pretty mesmerizing. We had lots of good talks about plant life cycles over the summer and it was super fun harvesting the seeds last week. Olivia and Gavin couldn’t believe how many seeds were in one flower! Once we brought it home, we put it in a paper bag and let it dry out for a few days. 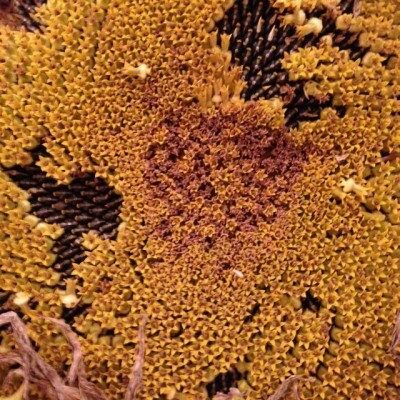 Once the flower head dries out, the remaining blooms brush off easily and you are left with the exposed seeds. The kids had fun pulling all the seeds off and we talked about how we could plant the seeds next spring and grow a bunch of new sunflowers. 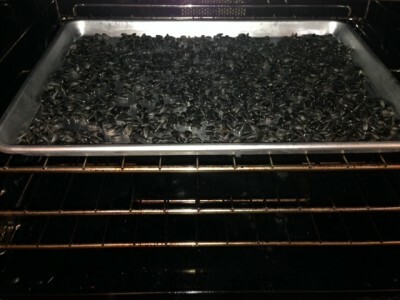 We decided instead to roast our seeds in the oven. Notice that the seeds were all dark black. 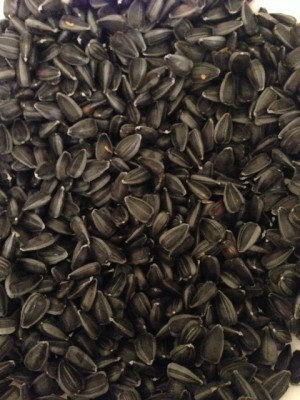 That is how they typically look in a bag of wild bird seed. I was curious what would happen to the color once we roasted them. 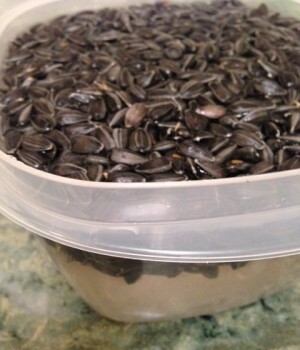 Prior to roasting the seeds, you soak them overnight in some salty water. I added about 1/4 cup of kosher salt to a 2-qt container of water. You then drain the seeds and spread them out on a baking sheet. Roast in the oven at 350 degrees for about 40 minutes. Check out the color change! They look… just like the sunflower seeds you buy in the store! Mind blown!!! They taste great. 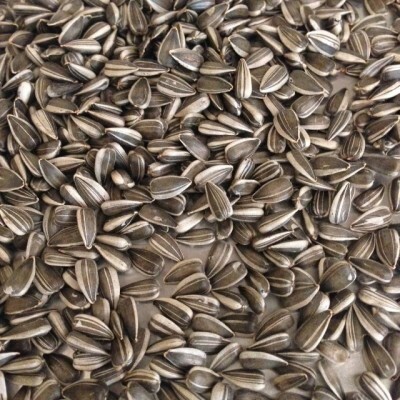 Ours are not very salty so depending on how salty you like your seeds, you might want to add more salt. 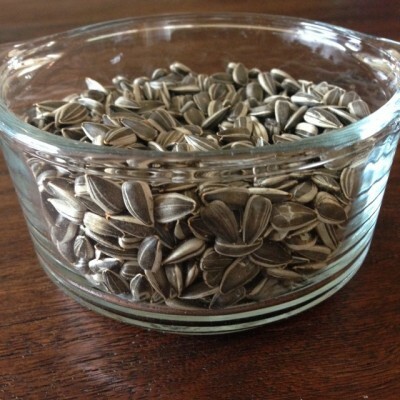 After the seeds cool, store in an air-tight container. Voila! What a fun harvest project! We are very excited to plant more sunflowers next year. We are going to bring another flower head home from the community garden so we can watch the birds enjoy it later this fall. Do any of you have any fun harvest projects going? If so, please share with us. Email me and we’ll have you guest post! Grandma totally approves of all those great pictures, your adventures and your story!